This is an entirely fresh look at Mao in both content and approach. It will astonish historians and the general reader alike. Based on a decade of research and on interviews with many of Mao's close circle in China who have never talked beforeand with virtually everyone outside China who had significant dealings with himthis is the most authoritative life of Mao ever written. It is full of startling revelations, exploding the myth of the Long March, and showing a completely unknown Mao: he was not driven by idealism or ideology; his intimate and intricate relationship with Stalin went back to the 1920s, ultimately bringing him to power; he welcomed Japanese occupation of much of China; and he schemed, poisoned and blackmailed to get his way. After Mao conquered China in 1949, his secret goal was to dominate the world. In chasing this dream he caused the deaths of 38 million people in the greatest famine in history. In all, well over 70 million Chinese perished under Mao's rulein peacetime. Combining meticulous research with the story-telling style of Wild Swans, this biography offers a harrowing portrait of Mao's ruthless accumulation of power through the exercise of terror: his first victims were the peasants, then the intellectuals and, finally, the inner circle of his own advisors. The reader enters the shadowy chambers of Mao's court and eavesdrops on the drama in its hidden recesses. Mao's character and the enormity of his behavior toward his wives, mistresses and children are unveiled for the first time. Mao tse-tung, who for decades held absolute power over the lives of one-quarter of the world's population, was responsible for well over 70 million deaths in peacetime, more than any other twentieth-century leader. He was born into a peasant family in a valley called Shaoshan, in the province of Hunan, in the heartland of China. The date was 26 December 1893. His ancestors had lived in the valley for five hundred years. After the success of Wild Swans, many would have rested on their laurels, perhaps churning out a follow up memoir or two. Not Chang; instead, she and her husband, historian Jon Halliday, took advantage of the financial independence provided by the success of Wild Swans to focus the next ten years of their lives on a book about Chairman Mao - a book that they believe reveals the true character of the man who ruled China for 27 years. (Reviewed by BookBrowse Review Team). [M]any of their discoveries come from sources that cannot be checked, others are openly speculative or are based on circumstantial evidence, and some are untrue. Jung Chang and Jon Halliday enter a savage indictment drawing on a host of sources, including important Soviet ones, to blow away the miasma of deceit and ignorance which still shrouds Mao's life from many Western eyes...Jung Chang delivers a cry of anguish on behalf of all of those in her native land who, to this day, are still not free to speak of these things. Written with the same deft hand that enlivened Ms. Chang's 1991 memoir, Wild Swans. Demonstrating the same pitilessness that they judge to be Mao's most formidable weapon, they unstitch the myths that sustained him in power for forty years and that continue to underpin China's regime....I suspect that when China comes to terms with its past this book will have played a role. Ever since the spectacular success of Chang's Wild Swans we have waited impatiently for her to complete with her husband this monumental study of China's most notorious modern leader. The expectation has been that she would rewrite modern Chinese history. The wait has been worthwhile and the expectation justified. This is a bombshell of a book. Jung Chang and Jon Halliday have not, in the whole of their narrative, a good word to say about Mao. In a normal biography, such an unequivocal denunciation would be both suspect and tedious. But the clear scholarship, and careful notes, of The Unknown Story provoke another reaction. Mao Tse-Tung's evil, undoubted and well-documented, is unequalled throughout modern history. A triumph. It is a mesmerising portrait of tyranny, degeneracy, mass murder and promiscuity, a barrage of revisionist bombshells, and a superb piece of research. [A] decisive biography...they have investigated every aspect of his personal life and career, peeling back the layers of lies, myths, and what we used to think of as facts...what Chang and Halliday have done is immense and surpasses, as a biography, everything that has gone before. The detail and documentation are awesome. The story that they tell, mesmerising in its horror, is the most powerful, compelling, and revealing political biography of modern times. Few books are destined to change history, but this one will. an important book to read! A 2-hour perusal of this book. Jung Chang was born in Yibin, Sichuan Province, China, in 1952. She was a Red Guard briefly at the age of fourteen and then worked as a peasant, a "barefoot doctor," (A lay health care worker who received 3-6 months training in basic medical principles), a steelworker, and an electrician before becoming an English-language student and, later, an assistant lecturer at Sichuan University. 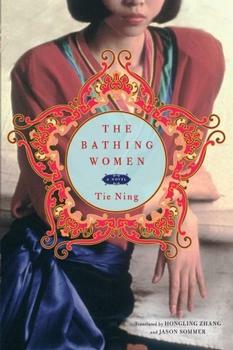 Spellbinding, unforgettable, and an important chronicle of modern China, The Bathing Women is a powerful and beautiful portrait of the strength of female friendship in the face of adversity. Inspired by a true story, and set against the backdrop of a country in transition, The Scavenger's Daughters is a sweeping present day saga of triumph in the face of hardship, and the unbreakable bonds of family against all odds.